If I was pressed to pick a favorite place to visit, most people could tell you it was London – with all apologies to the rest of the world and some of the fabulous places I’ve visited. But a very close second would be Edinburgh. Despite the cold winters I’ve visited during, there is a warmness in my memory of this welcoming, old city. There is evidence of human activity around Edinburgh stretching back into the Iron and Bronze ages. By the 8th century, Edinburgh was part of the kingdom of Northumbria, an Anglian kingdom. 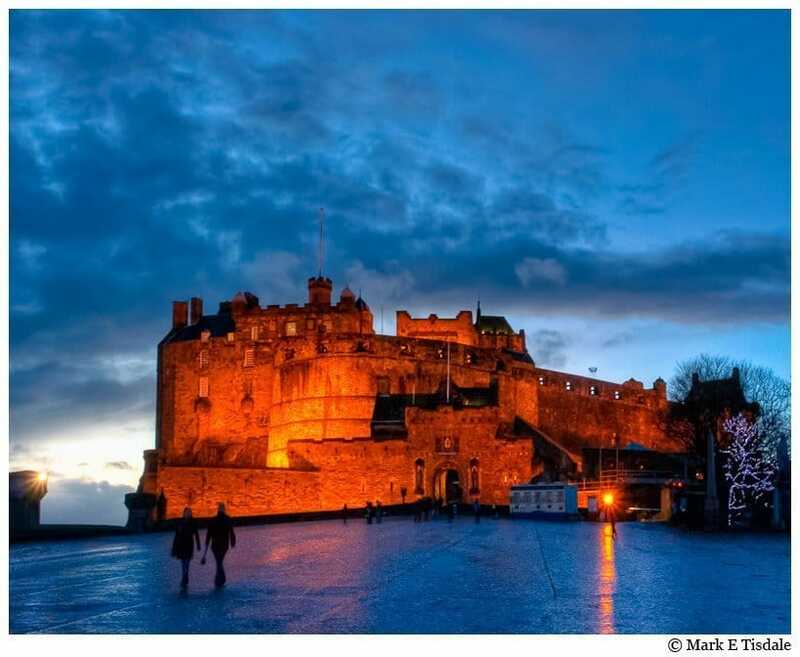 When the city was formed, it surrounded Castle Rock, the stump of an ancient volcano, site of King Edwin’s Fort, which was known as Din Eidyn (Edwin’s Fort). The land leading up the rock gradually came to us through the ages into English as first Edwinesburch and finally Edinburgh. And in time, the territory where Edinburgh lay went from Northumbria, to the Danelaw, and finally the Scots. This ridge that is the core of Edinburgh today is known as the Royal Mile, a stretch of old town that rises from the Queen’s palace, Holyrood, at the foot, to Edinburgh Castle at the top of the mile. It’s along this mile that the buildings bear out the history of the medieval city that blossomed in Scotland. While this print doesn’t portray much of the Medieval charm that can be found along the Royal Mile, it is my favorite shot from that storied street. I know, sometimes I feel like a one trick pony, but I really love these classic red phone boxes. And in this case, there was very little color in this photo, being at night, so yes, I had to do my classic spot color red on this one. 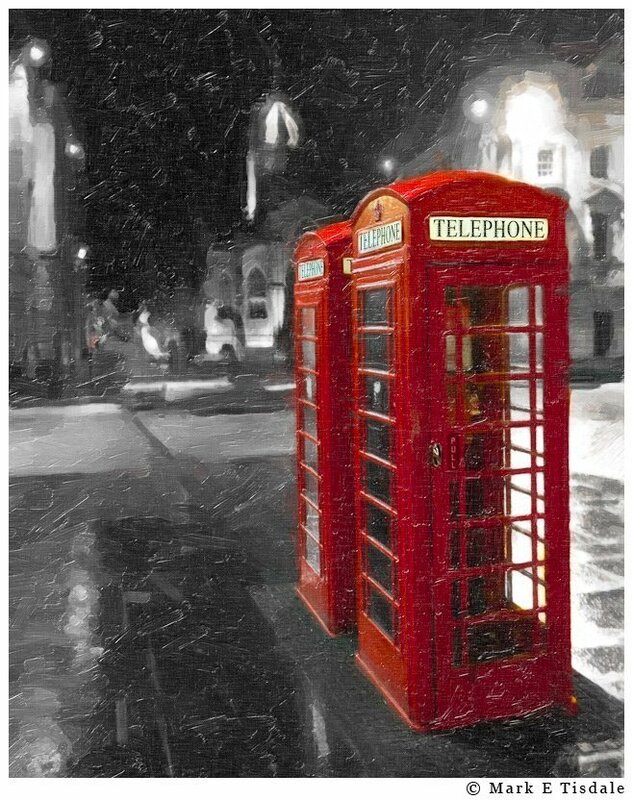 I really love how this one turned out, the wet paving stones reflecting the street lights and that pop of red from the telephone booth really just makes me think of those damp evenings walking around the old city. This was taken along the Royal Mile just above St. Giles Cathedral, which can just be seen on the skyline in the middle of this shot. As long as we’re discussing the Royal Mile, I might as well show both ends of it. At the bottom of the Royal Mile is Holyrood Palace, directly adjacent to the new Scottish Parliament (something of a message there you think?). 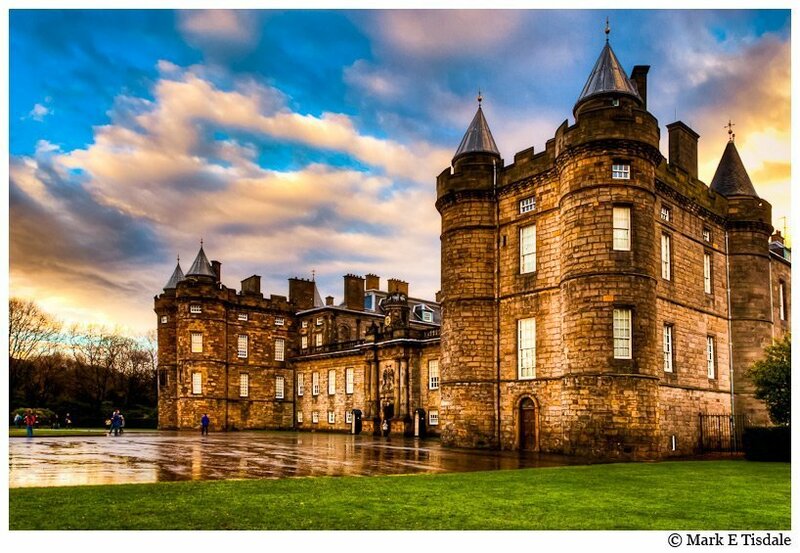 Holyrood is the official home of the reigning monarch in Scotland. The Queen spends a week here each year, although her actual residence and favored summertime retreat is at Balmoral, where she moves onto from Holyrood. There has been a royal presence at Holyrood since King David I of Scotland built an abbey there in 1126. All that remains of the Abbey today is ruins adjacent to the palace, the current incarnation of which was built in the 17th century. This photo was captured on the evening of a storm, owing to the exceptional sky over the palace! Perched at the top of castle rock in a particularly defensible position, is Edinburgh Castle. There has been human activity here since the 9th century. The current castle mostly dates from after the 16th century (although there are some older buildings within the castle walls). This photo was taken as dusk set on my last evening in the capital city of Scotland. The Esplanade, where the famous military tattoo is held each August, stretches out before you and the castle is lit up. This is the scene that hovers over the city each night. There are more photos of Edinburgh and Scotland in my Britain gallery – I hope you’ll take a look! I really love your photography. Never really considered photos as art- but these are beautiful. Thanks for expanding my little world. Karen, that’s awesome to hear! Photography is definitely my passion, so knowing that it was a success both in beauty and in “expanding” your world is a definitive compliment. Your work is so breath taking and I am so glad I looked at your page. My hats off to you living your dream I envy you! I love photography and I could only wish to learn a pinch of what you know your pictures are beautiful. I am a fan! Linda, this is an awesome note to greet the morning with! I’m thrilled to hear that you enjoyed my photos and will be checking in for more in the future! Thanks again and look forward to any questions or comments you might have in the future.